If for former president Thabo Mbeki his recent missive about HIV-Aids was an intellectual exercise, for many South Africans — not least, the thousands on antiretroviral treatment — it was re-opening of painful wounds. By ANSO THOM. The dictionary defines déjà vu as among others “a feeling of familiarity, already lived through something, a feeling of recollection”. The last week has elicited a severe and at times frightening sense of déjà vu for HIV activists, researchers, scientists, people living with HIV, health workers and journalists. 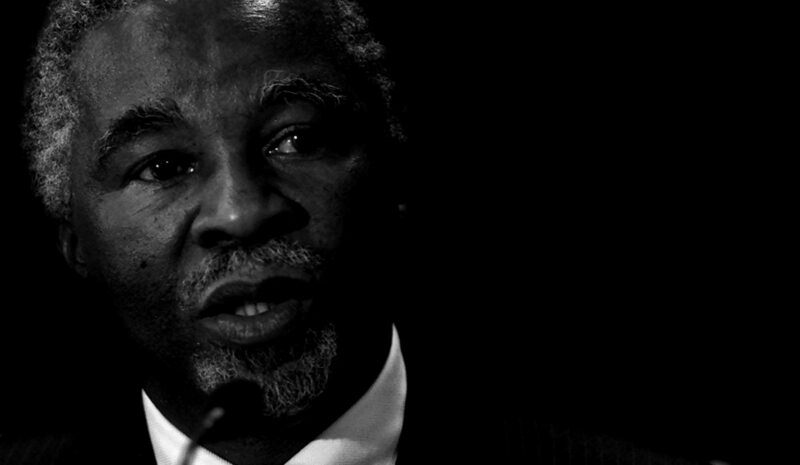 There was a belief that the horrific denialist era was in our past, and many were unsettled by how much anger they felt this week when Mbeki simply picked up where he had left off. Many of us were there when Dr Manto Tshabalala-Msimang took over the health minister post in June 1999. We were filled with so much hope as she had in the past proven to be on the right side of history. She had hardly landed in her new office when she jetted off to Uganda, the then darling of the donor world, and returned announcing that ensuring HIV-positive women access to drugs to prevent them from passing the virus on to their newborns during birth was a priority. She enjoyed engaging with the media and had an open-door policy, keen to share her ideas and plans. The honeymoon didn’t last, and four months after Tshabalala-Msimang took office, President Thabo Mbeki made a speech in the National Council of Provinces that pulled the rug from under everyone’s feet, including hers. He cautioned against antiretrovirals, intimating the drugs were toxic, and set off his oft repeated belief that HIV cannot cause Aids. He was by all accounts a textbook Aids denialist. There is an unconfirmed story that a panicky Tshabalala-Msimang, who was at the time in Gauteng, ordered a bodyguard to personally fly a printed version of the infamous Castro Hlongwane document (Mbeki was the founding author of this bizarre document which pushed all kinds of quack theories) to her advisors in Cape Town. She asked them to read it after it arrived late at night and hand it back to the bodyguard, terrified that it would get out. Her advisors were horrified. Nobody quite knows what made the minister switch to the wrong side of history and there have been many theories including the fact that Mbeki and Tshabalala-Msimang had a close friendship, having fled into exile as part of the same group. We will never fully understand, but we now know that Mbeki, irritated by the constant criticism of his denialist HIV beliefs and contact and engagement with quack “doctors, scientists and researchers”, retreated into a corner like a sulky child, saying he would no longer be speaking on the subject. But the damage was done and Tshabalala-Msimang stepped into the role of his chief defender, propagandist and implementer. It is no secret that today our health system is still paying the price for years of madness, trying to pick up the pieces and deliver a health system that saves lives. So, when Mbeki this week released his missive on HIV, it ripped us back through a sci-fi tunnel and straight back to cuckoo land, a place we thought we had long left. GroundUp, Health-e News Service, the Treatment Action Campaign, the SA National Aids Council, scientists such as Professor Salim Abdool-Karim and Professor Malegapuru Makgoba and Advocate Jonathan Berger, among others, have eloquently dealt with the contents of the Mbeki letter. Last week has also ripped me back to a time as a health journalist I would rather forget. A time spent in hospital wards at GF Jooste Hospital in Cape Town and Worcester Hospital where I witnessed young people, mostly women, emaciated with crusts of painful, white thrush caking their cracked lips. Lying in their own urine and vomit and diarrhea as overwhelmed nurses run around trying to deal with IV drips and all the demands of an overfull medical ward. A time when I watched a young woman arrive at an emergency ward, her eyes wide as she gasped for breath, as life slowly drained from her young body, and then saw her devastated family arrive in the middle of the night, their hunched bodies wrapped in blankets, coming to fetch the body of the child who died too soon. A time when I watched a young boy stand on a world stage at the International Aids Conference in Durban, begging for Mbeki to make treatment available so other children would be spared his fate. We now know his plea fell on deaf ears and despite fighting until the end, Nkosi Johnson gave up his brave fight when his mother Gail told him it was okay for him to go and rest. This week Mbeki, and all those who are now crawling out of the social media woodwork, spat on the graves of these people. They continue to allow their egos and determination to be “right” to cloud their judgement. Quacks, who had long ago crawled back into their holes, have again emerged. This week the media screamed in a headline, “Independent researchers confirm Mbeki was right”. Huh? Anthony Brink, one of the lead quacks and someone who managed to bend Mbeki’s ear, has crawled out the woodwork and somehow convinced a journalist that he is an “independent researcher”, that he should be heard. It is less concerning that Brink is again voicing his opinion, but more concerning that a journalist did not take the time to do a simple Google search to understand that Brink deserves no professional platform and needs to remain on the rubbish heap of this time in our history. Sadly, It is once again time for good men and women — researchers, scientists, journalists and activists — to stand up and shut all these people up once and for all. And fortunately they are doing so in the most dignified and firm manner. We cannot consider ignoring them, even though that is what one would prefer — we owe it to those who died and whose children today live in orphanages and other places of (hopefully) safety, to speak out. The train has left the station and Mbeki and his praise singers are no more than a pathetic bunch of has-beens that need to join the Brinks of the world on the rubbish heap of HIV’s sad history. We don’t care what you think or believe or want, Mr Mbeki. Your failure to act in responding to HIV when the whole world begged you will forever be a black mark against your name. Your renewed attempt to introduce your quack views is quite frankly pathetic and bordering on criminal. * Anso Thom is the editor of the NSP Review, a Treatment Action Campaign and SECTION27 publication, which monitors the state of the health system in South Africa. She is also the head of Communications at SECTION27 and has been a health journalist for more than 20 years. Photo: Thabo Mbeki, President of South Africa, talks to the media on the situation of his country, during the World Economic Forum (WEF) in Davos on Monday, January 31, 2000. EPA PHOTO KEYSTONE/ALESSANDRO DELLA VALLE.